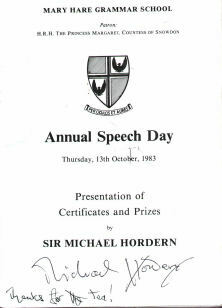 Programme for Annual Speech Day, Thursday 13 October 1983. The Chairman of the Board of Governors, Dr. Elizabeth Dyson, will preside and ask the Principal to present his Report for the year 1982-1983. The Chairman will invite Sir Michael Horden to present the prizes and address the meeting. Mr. R.S. Eldridge, M.A., Dip.Audiol., will propose a vote of thanks to the Guest of Honour. Annabelle Bolingbroke-Kent, the Head Girl, will propose a vote of thanks to the Chairman and the Governors. After the ceremony the School, Mansell House, and the Manor House will be open for inspection by visitors.